Senator Bob Menendez, shown here on Twitter celebrating National Pancake Day earlier this week, has something a little more serious on his plate this afternoon. CNN is reporting that Menendez, New Jersey’s senior Senator, and the former Chairman of the Senate Foreign Relations Committee, will face federal criminal corruption charges for allegedly using his Senate office to promote the business interests of Dr. Salomon Melgen, a Florida ophthalmologist. Under a headline reading, “Menendez Expected to Face Federal Corruption Charges,” the New York Times indicates that federal prosecutors are focused on gifts Mr. Menendez received from Dr. Melgen in exchange for official acts. Charges could be filed within a matter of weeks. 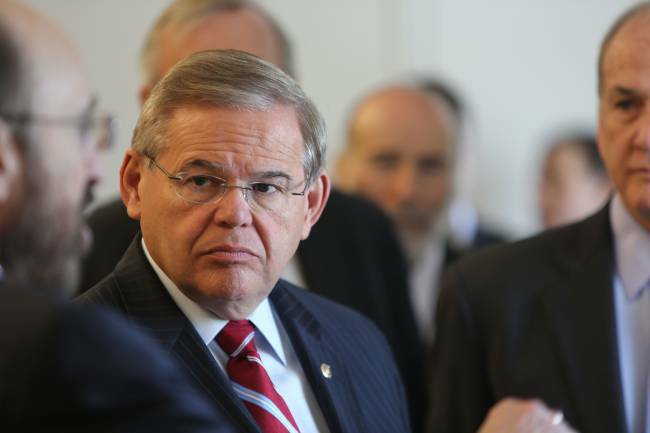 Evidence of his problems surfaced in 2013 when Menendez had to pay back $58,000 for free trips to the Dominican Republic he’d taken on Melgen’s plane. Later, there were charges of impropriety after the Senator defended Melgen against Medicare’s accusations that he had overbilled for services in his eye care practice, and helped Melgen who sought a port screening security contract in the Dominican Republic. “In the past,” as the National Journal reported this afternoon, “Menendez has denied any wrongdoing.” On occasions, he has blamed Cuban intelligence agents for pushing the allegations against him, and called the Justice Department probe a part of their smear campaign, as The Daily News remembered today. Senate seats in New Jersey are not without controversy. On May 1, 1981, the late Senator Harrison “Pete” Williams was convicted on nine counts of bribery and conspiracy for promising to use his office to further a business venture, as the New York Times reported. Two decades later, Senator Bob Torricelli, also a New Jersey Democrat, withdrew from his 2002 reelection campaign after being “severely admonished” by the Senate Ethics Committee for accepting gifts from a donor in exchange for having intervened on his behalf in overseas business deals (earlier, a yearlong Justice Department investigation ended without charges being filed). Torricelli was the primary author of the 1992 Cuban Democracy Act, which codified and strengthened sanctions against Cuba, barred ships that dock in Cuba from landing at U.S. ports for six months, and prohibited foreign subsidiaries of U.S. companies from trading with Cuba.